This episode started out as a two person game with Breja and Jen. They were later joined by Lanntonio, almost at the last minute. The gang’s all here! They discussed what they doing in game as Season 5 was winding down, and planned ahead for Season 6. * We read and responded to tweets from @grimaldius44, @eG_acefisher1, @Slugnutty, @TheWMWorkshop, @JCMonkeyD3, @ShatteredStone, @CM_Nevalistis, @Aahzmmadius, simple_destro, @cmack1977, and @ladybirdness. * We didn’t receive any emails this time around. Send your comments, questions, and Diablo related stories to show@ShatteredSoulstone.com and we will share it on the next show. * Community Manager Nevalistis posted Patch 2.4.1 Preview: Cosmetic Items on Battle.net. New pets, new transmogs, “extra-rare rewards” and more! * Blizzcon will happen on November 4, and November 5, 2016. Tickets went on sale on April 20, and April 23, 2016. Congrats to everyone that got tickets! * Blizzard posted a blog on Battle.net titled: Pre-Purchased Overwatch? Mercy’s Wings Now Available. Mercy’s Wings are available for those of you who play Diablo III on PC and who pre-purchased the digital Windows PC version of Overwatch: Origins. 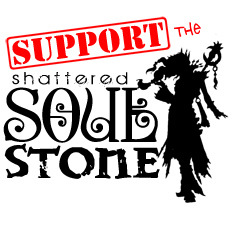 * @TataSinke included Shattered Soulstone episode 116 in the April 18th edition of his New Tristram News. Thank you, TataSinke! In this episode, we are without our dear fourth musketeer and missed him dearly. Fortunately the rest of the crew was able to overcome numerous technical difficulties and we get down to business by discussing what we’ve been up to in-game: Jen finally played her male wizard again, Breja may or may not have lost his Apple, and Nevik recorded from inside a bottle of white, white wine! * We read, and respond to, another mountain of emails we received from our wonderful listeners. This batch comes to us from Chad, Amrik, and Torrack. Thank you for the email! Keep them coming, really! * We received tweets from @Tigjamie, @theRealJFrench, @CkRtech, @eG_acefisher1, @Daladria, @shawno, @scanline75, @Diablo and our very own @QueenofHaiku! Thank you for your tweets. Don’t forget that you, too, can send in your thoughts via social media outlets such as Facebook, Google+, and Twitter. * We finally know when Blizzcon 2013 tickets go on sale! Ready your F5 key on Wednesday, April 24th at 7pm pacific and Saturday, April 27th at 10am pacific. * We discuss our thoughts on a few of the multiplayer improvements coming in patch 1.0.8 shared in the developer blog written by none other than the wizard-hater himself, Wyatt Cheng. * Eat Game Live was recently highlighted as FAN CREATION OF THE WEEK for their rendition of the Horadric Hamburger. We wish we had that many noms noms per second. * If you’re not familiar with David Lines’ *ahem* line of cosplay, check out his DeviantArt portfolio. Diablo cosplay is the best cosplay, or at least we think so. * Our friend, Dred, recently sat down with Julie Humphreys at PAX East to discuss the Playstation 3 version of Diablo 3. You can find a transcript of the video interview at Dred’s site, DiabloExpressions.com. * Blizzard recently updated their Rollback Policy after some abuse of their previous policy. We highly suggest you check out the updates and suggest that you pick up an authenticator to protect your account from being hacked if you haven’t already.